Are you ever in for a treat! 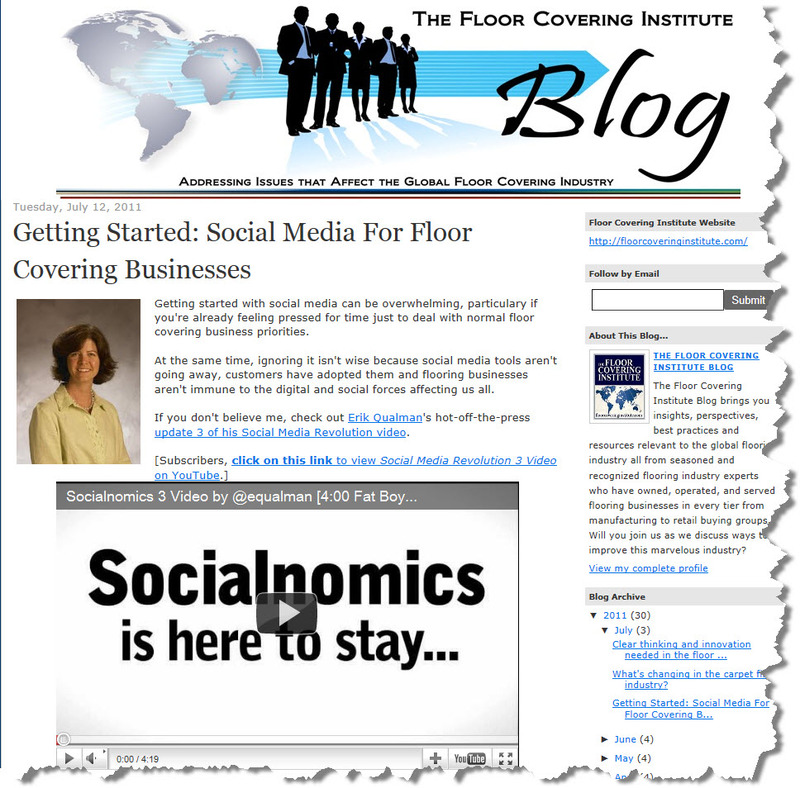 In my latest post for the Floor Covering Institute Blog, titled Getting Started: Social Media For Floor Covering Businesses, I had the opportunity to talk basics about social media. No surprise - whenever I talk social media, I like to provide perspective on the marketplace as well as on the evolution of the tools and how they are used. After all, how can you make meaning with digital tools if you don't understand the bigger picture that our customers - and their customers - live in? which is also my favorite social media video, created by Erik Qualman from Socialnomics, Social Media Revolution - in this case, version 3! The big deal here is that I had gone out into the webisphere in search of Social Media Revolution version 2, created in May 2010, and - I couldn't believe my luck! - chanced upon this latest updated, released on July 5, 2011. Impressive timing, don't you think? Do, go check out the resources - especially the video - and then, let me know what you think. Did you like the video? Did you like my blog article? Where the resources helpful? 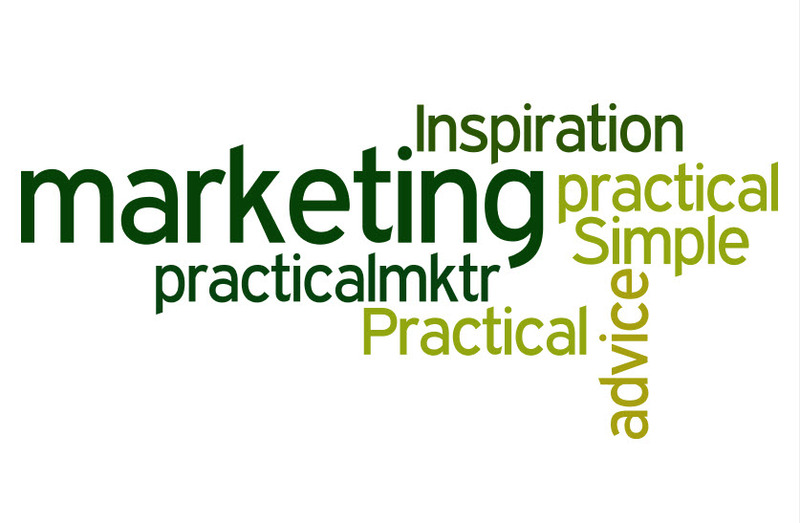 Change is afoot with Simple Marketing Now and I'd like to share that with you. Namely, I've launched a new blog titled the Content Talks Business Blog. It's intensely focused on content marketing and social media marketing for business. Generating Leads With Social Media relates to my presentation at MarketingProfs B2B Forum 2011. At that same conference, I enjoyed hearing about Facebook success stories. 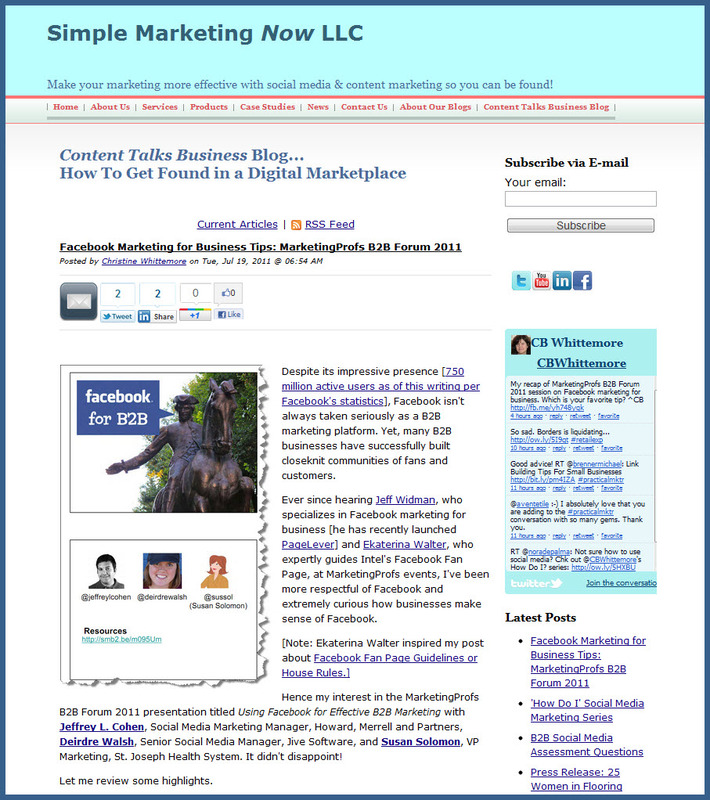 Here is my recap: Facebook Marketing for Business Tips: MarketingProfs B2B Forum 2011. I added to my How Do I? series with How Do I Get More Business? 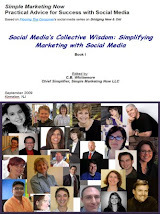 13 Tips and summarized the series in 'How Do I' Social Media Marketing Series. In B2B Social Media Assessment Questions, I recap many of the questions that come up during a client assessment session. I love the additions included in the comments! Perhaps you'll think of a few more to add. If you're looking for practical SEO perspective, you'll enjoy The Business of SEO: Get Found which captures highlights from a CBSAC/NY event. Finally, an official announcement - Press Release: 25 Women in Flooring Industry Includes Whittemore - about the news you read first in 25 Flooring Women to Reckon With! and a Welcome to the Content Talks Business Blog! 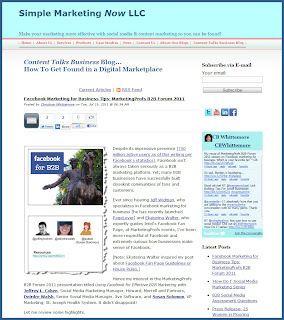 I invite you to check out the Content Talks Business Blog. Do the blog articles bring to mind burning business topics you'd like me to address? If you like what you see, perhaps you'll subscribe for updates and let others know, too. [Did you enjoy your Bastille Day celebrations?] 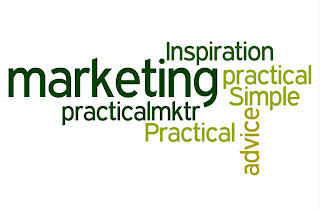 Here are the latest links and resources shared on Twitter and tagged #practicalmktr grouped here together in Practical Simple Marketing In The News for 7/15/11. I hope you had a good return from July 4th or Canada Day holidays. Here are the 7/8/11 links and resources shared on Twitter and tagged #practicalmktr grouped here together in Practical Simple Marketing In The News. As valuable as Google is for digital visibility and for search & discovery, it's also an amazing productivity enhancer as I discussed recently with TalkFloor's Dave Foster. 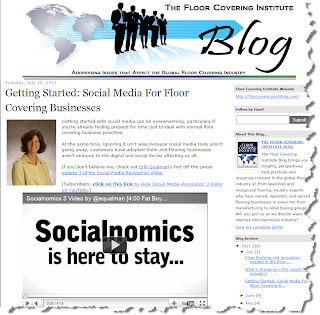 Christine Whittemore, Simple Marketing Now in an ongoing series on online tools and social networking discusses Google as a productivity enhancer in areas of communications, collaboration, organizational, analysis, and advanced publishing. Whittemore talks about topics from chat opportunities and voice mail to working on community documents to Webmaster tools. 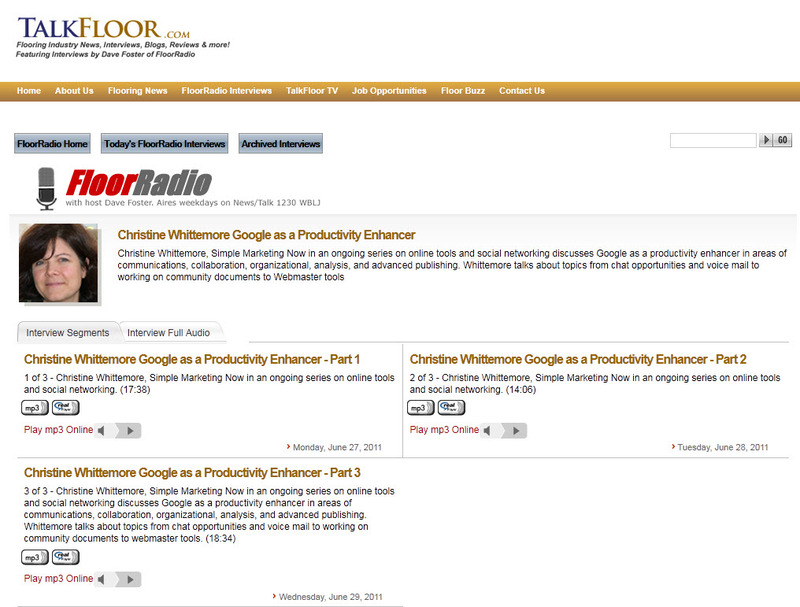 You can access all three parts of the interview by clicking on Christine Whittemore: Google as Productivity Enhancer. The segments range from 14 minutes to 18 minutes. 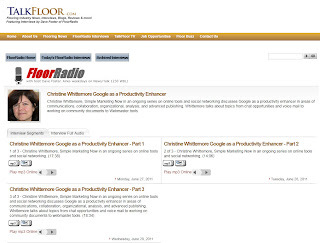 I consider to topic of Google the productivity enhancer particularly relevant for small to medium sized businesses – such as floor covering retailers, tile & stone contractors and others in the flooring business - which now have access to tools that used to only be available to large organizations with significant resources! NOTE: To access most of these tools, you need a gmail account. You may consider others, but these struck me as the major ones. Google docs are a terrific way to collaborate regardless of location! My favorite example is the master Twitter chat document which details all of the Twitter Chats taking place. The document is public and crowd sourced so it is always up to date. It's also very easily accessible. I've just recently used Google docs to create a lengthy survey. The results automatically pre-populate a spreadsheet for easy analysis. Calendars, as Daryl Ciokiewicz from Floorcrafters in Wisconsin does, can be used to schedule installers. Google Groups allow you to organize people and explore already existing groups. Sites allow you to create a wiki for your work group to exchange information and collaborate. Google Sketchup – I learned about this from Paul Anater, Kitchen & Residential Design. He uses it to create 3d models of spaces he is designing. If you haven't yet, do try Picasa to help organize, edit and share photos. Install it on your desktop and it will find all the photos you have on your computer and organize them so you can actually find them when you need them! I like to use Google Calendar as a content calendar. I find it more user friendly than Outlook Calendar for that purpose. I also use the to do list functionality. Don't forget Google Reader to organize your different feeds and alerts. You have two powerful tools available here: Google analytics for websites and Webmaster tools. Google offers many valuable tools for publishing: Blogger, YouTube, Feedburner, Picasa online, and Picnik for easy online photo editing [~ photoshop]. This conversation only scratched the surface of what's available from Google to help with productivity. You may be looking for a checkout solution for your website or a means for translating your content into another language. Google even offers Google apps for Business instead of using Microsoft Office, for example. Go create a gmail account, experiment with communicating, collaborating or organizing. Explore Google/options and let me know in the comments which Google tool you find most interesting. How has it improved your productivity?